Part of a collection of GB packs I have. GB- Europa (also nice post boxes on the pack). 1984 "25th Anniversary of the CEPT"
. Designer - Jacky Larrivière (France). My scanner decided to do close ups as well. 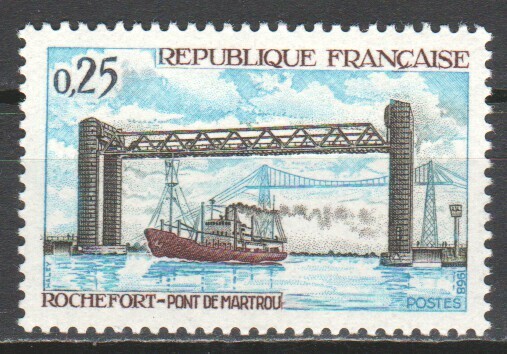 The Pont de Martrou at Rochefort on the west coast of France on a 1968 French stamp to commemorate its opening. This vertical lift bridge replaced an earlier transporter bridge: it was itself replaced by a 2-carriageway road bridge in 1991. It was on an island just off Rochefort that Napoleon surrendered to the British after his defeat at Waterloo in 1815 - he had been hoping to escape to the USA. 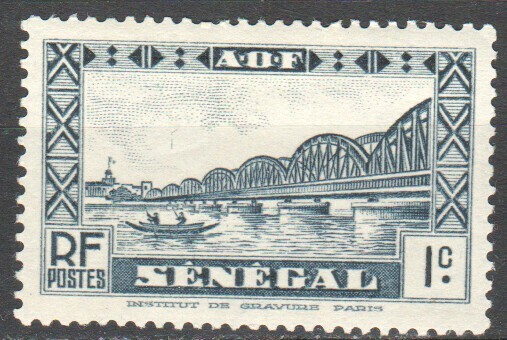 Faidherbe Bridge in Senegal features on a number of stamps in the country's 1935-40 definitive set, including this one. The heart of the city of Saint Louis - which was the capital of the French colony until 1902, and served as the administrative capital of next-door Mauritania from 1920 to 1957 - is on an island in the Senegal River, and the bridge links the island to the mainland. It opened in 1897.